Applications are invited for temporary post of JRF and Lab attendant in a DBT funded project. Last date for application is 13-Apr-2019. The details regarding qualifications, emoluments and application process may be downloaded here. Title: "Screening for host factors and neutralizing mAbs for respiratory virus infections". Date and Time: March 11, 2019 (Monday) at 11AM. Venue: Seminar Room in Department of Microbiology (1st Floor of Bachhawat Block). This talk will be focused on using unbiased discovery approaches to identify human host factors required for hantavirus entry and neutralizing monoclonal antibodies (mAbs) against respiratory syncytial virus (RSV). The interviews for admission to PhD Microbiology will be held on 14th March 2019 at 10AM. The schedule for the same may be downloaded here. Candidates are requested to carefully read the instructions given in the schedule. Number of seats available in this round of admission is One, in the specialization area of "Recombinant Protein Expression, Bioprocess Optimization". The Department organized 'Sports Day' on 15th Feb 2019. All students, staff, and faculty members participated in various games and activities. The winners received prizes and everyone enjoyed. Pictures are here. The admission portal will be open for registration of students (who had not applied earlier) from 14-Feb till 28-Feb 2019, for admission to PhD program based on interview. Number of seats available in this round of admission is One, in the specialization area of "Recombinant Protein Expression, Bioprocess Optimization". For details, visit PhD admission page of Department here. The puzzle for Jan 2019 was created by Jatin Chadha and Lavanya Khullar (both MSc Student). 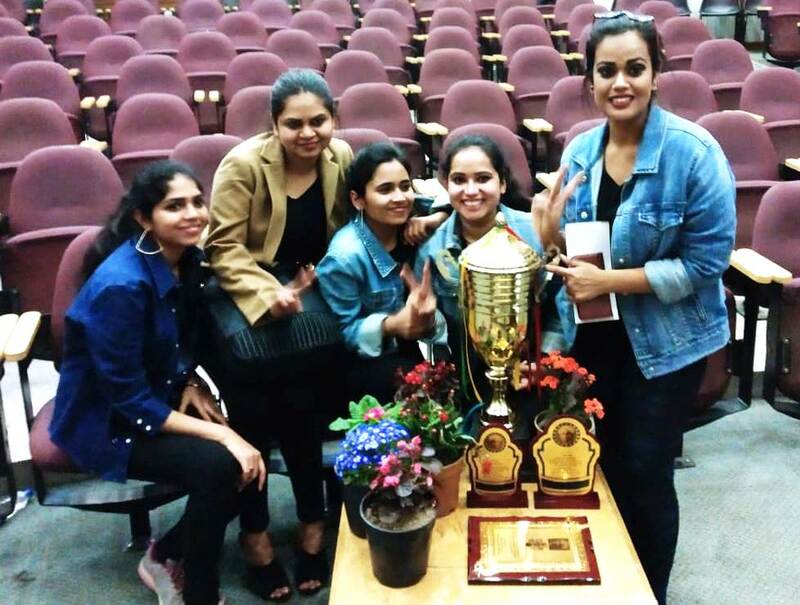 The competition was held on 11-Jan-2019 after the Journal club and Work presentations. The student participants were required to fill the answers on the spot in 30 minutes. And the winners are- First: Vishal (19.5/23), Second: Mohini (19/23). More details here. On 11-Jan-2019, Ms.Arushi Khanna will be presenting a paper titled "Staphylococcus aureus biofilms release leukocidins to elicit extracellular trap formation and evade neutrophil-mediated killing". The paper may be downloaded here. This will be followed by work presentation by Ms.Juhi Jain. The class time table for M.Sc. and Ph.D. for coming semester can be downloaded here (M.Sc. 1st year), here (M.Sc. 2nd year) and here (Ph.D.). The classes will start from 01-Jan-2019. On 16-Nov-2018, Ms. Pallavi Gulati will be presenting a paper titled "Folate conjugated vs PEGylated phytosomal casein nanocarriers for codelivery of fungal and herbal derived anticancer drugs". 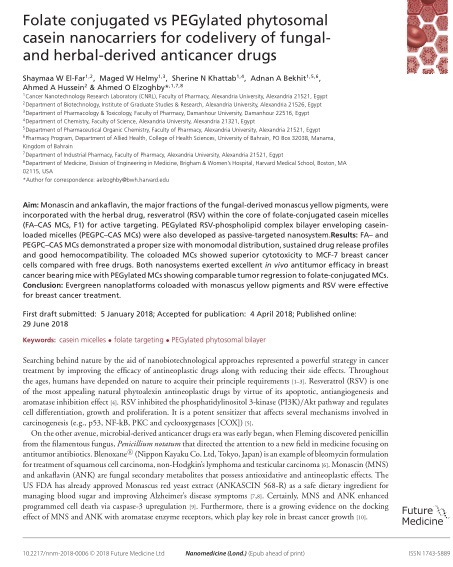 The paper may be downloaded by clicking on image below. This will be followed by work presentation by Ms.Jyoti Pal. Students, Teachers and Staff of Department celebrated Deepawali on 05th Nov this year. Details and pictures are here. Gallery here. 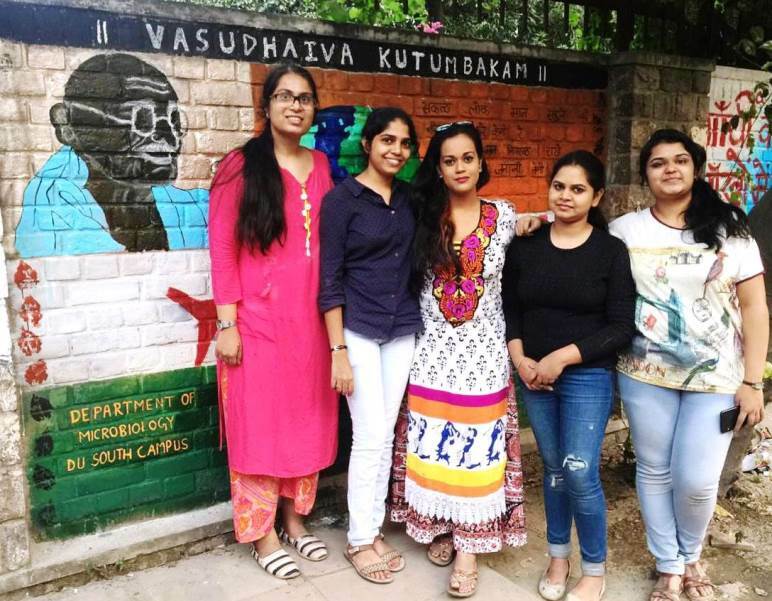 Five students of the Department participated in wall painting competition organized by the University in North Campus on 26-Oct-2018. Details and more pictures here. On 12-Oct-2018, Ms.Juhi Jain will be presenting a paper titled "Treatment of Human Glioblastoma with a Live Attenuated Zika Virus Vaccine Candidate". The paper may be downloaded here. This will be followed by work presentation by Ms.Varshni Sharma. Department celebrated Microbiology Day on Friday, the 28th Sep 2018. Students participated in various activities and competitions including Quiz, Petri Art, Just a Minute, Dumb Charade, and Rangoli. Pictures here. The list of candidates selected for admission to Ph.D. program in Microbiology may be downloaded here. The selected applicants are required to report to office of Department of Microbiology. On 14-Sep-2018, Ms.Jyoti Pal will be presenting a paper titled "Exopolysaccharide protects Vibrio cholerae from exogenous attacks by the type 6 secretion system". The paper may be downloaded here. This will be followed by work presentation by Ms.Babbal. Students, teachers and staff of the Department celebrated 'Teachers day' on 05-Sep-2018. Students presented a cultural program which was followed by conduct of a game in which everyone participated. Students felicitated the teachers and staff members on the occasion. Pictures here. The list may be downloaded here. The provisionally selected candidates may report to office of Department of Microbiology in South Campus latest by 4 PM on 08-Aug-2018. The list may be downloaded here. The provisionally selected candidates may report to office of Department of Microbiology in South Campus latest by 4 PM on 27th July 2018. The result for MSc entrance exam has been declared. It may be downloaded here. The notification of first list for admission to MSc Microbiology is expected by 25-July-2018. The revised admission schedule for PG admisison (2018-19) may be downloaded here. The International Day of Yoga was celebrated in Department on 21-June. An interactive Yoga session was organized. Click on link below for report and pictures. A report on Nipah virus outbreak ongoing in Kerela, written by Vishal Dashora (M.Sc. Final). The online registration for admission to M.Sc. and Ph.D. Microbiology for academic year 2018-19 has started. The admission portals will remain open for registration till 07-Jun-2018. For registration, please visit P.G. admission portal of University here, and Ph.D. admission portal here. 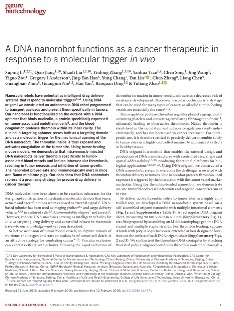 On 18-May-2018, Ms.Babbal will be presenting a paper titled 'DNA nanorobot functions as a cancer therapeutic...' which may be downloaded by clicking on the image below. This will be followed by work presentation by Ms. Meenu Saini. Our website has been bestowed with the 'Best Website Award' in Department Category by University of Delhi. The award was conferred on the occasion of the 96th Foundation Day of the University of Delhi celebrated on 1st May, 2018. We thank University of Delhi for the encouragement. The Department of Microbiology is in the process of revising the syllabus of M.Sc. Microbiology program under Choice Based Credit System. The draft of the revised syllabus has been prepared after taking into consideration the feedback obtained from multiple stakeholders including the present students, the alumni, as well as prospective employers from the corporate sector. The Department invites your views and suggestions on the same which may be submitted only by email at microsdc@south.du.ac.in latest by 5 PM on Friday, the 4th of May 2018. The draft of syllabus may be downloaded here. On 20-April-2018, Ms.Nivedita Gaur will present her pre-PhD submission seminar entitled -“The role of human tumor associated herpesvirus latent antigens in epithelial to mesenchymal transition of cancer cells" at 11AM in Seminar room of the Department. 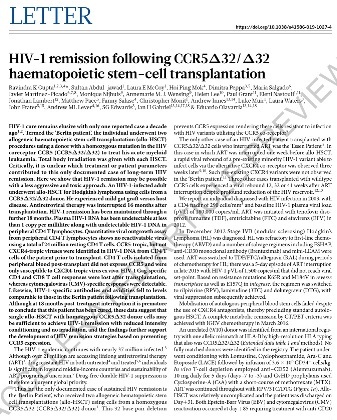 On 13-Apr-2018, Ms.Ashima Dua will be presenting a paper which may be downloaded by clicking on the image below. This will be followed by work presentation by Mr.Gaurav Kumar. 12-Apr-2018: Notice for inviting applications for inclusion of name in panel for ad-hoc appointment of Assistant Professors in Microbiology Department in different colleges of University of Delhi. Last date of application is 07-May-2018. Notice, Proforma. Further details here.